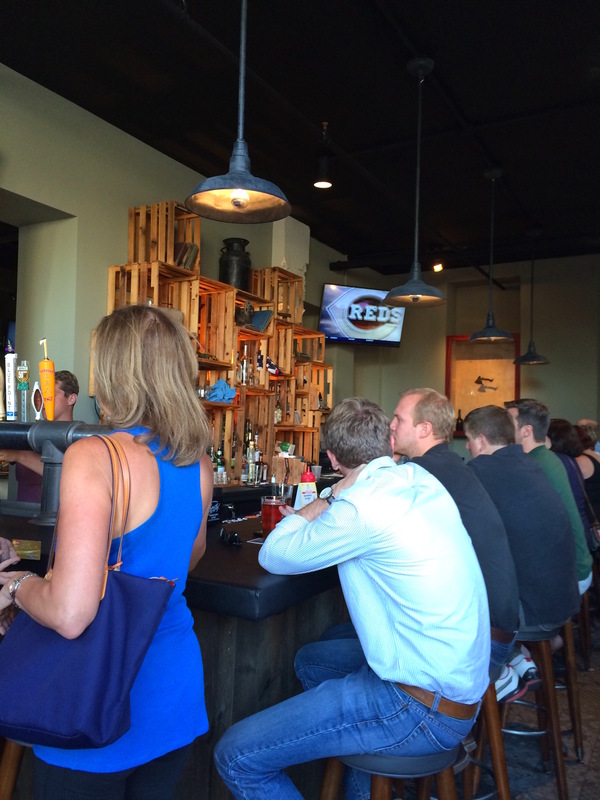 Nation Kitchen & Bar – Go There. Try That. My first visit to Nation Kitchen & Bar, located at Broadway Square in the Pendleton Art District of Cincinnati, occurred during Burger Week. I was lured in by their Quesadilla burger. So glad they caught me. I have since been back to Nation to explore their menu further! Not sure what church this in the backdrop, but it’s beautiful! At Nation Kitchen and Bar I’ve enjoyed the whiskey bacon burger ($9), the quesadilla burger ($9), and bologna sandwich ($8). This is the beauty of dining with friends and family! Share! Both burgers were delicious and very different from each other. 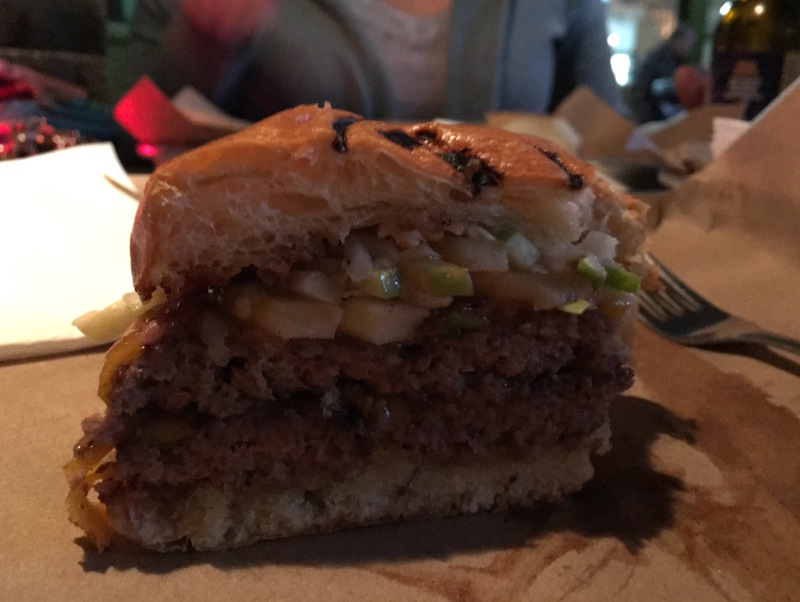 The best part of the whiskey bacon burger is actually the part that made me apprehensive about ordering it- the apple slaw. Somehow the fresh apple with the barbecue sauce and bacon just works perfectly! 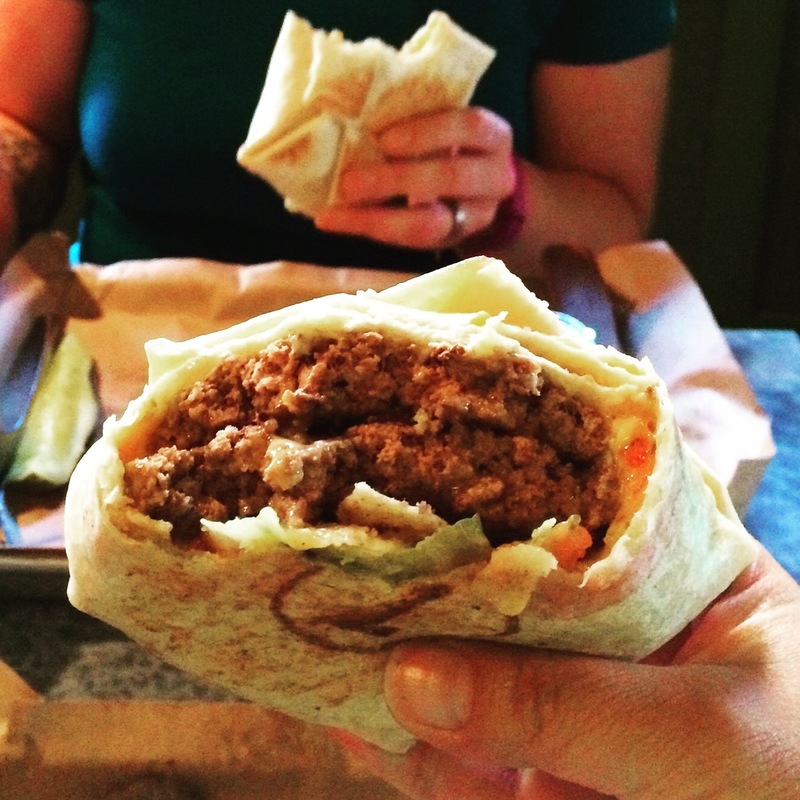 The beef is tender, the bun is soft, and the slaw brings a brightness. This is a winner. The quesadilla burger, wrapped in a flour tortilla, has queso, pepper jack, pico, and lettuce. Basically I love all these ingredients and Nation demonstrates they are not just for Mexican food; these make a darn good burger! My only suggestion, more pepper jack cheese in the middle. Otherwise, this is a solid eat and very satisfying! When you order burgers or other sandwiches, you have the choice of tator tots, fresh cut fries, and sweet pot tots. The next step is to dress those potatoes up one of four ways: loaded (cheddar, bacon, green onion, ranch), poutine (Monterey jack, bacon, gravy, parsley), totcho (queso, jalapeño, pico, taco meat, ranch), and extra crispy (no topping). Let me just say, the loaded fries and poutine tator tots are both an indulgence. 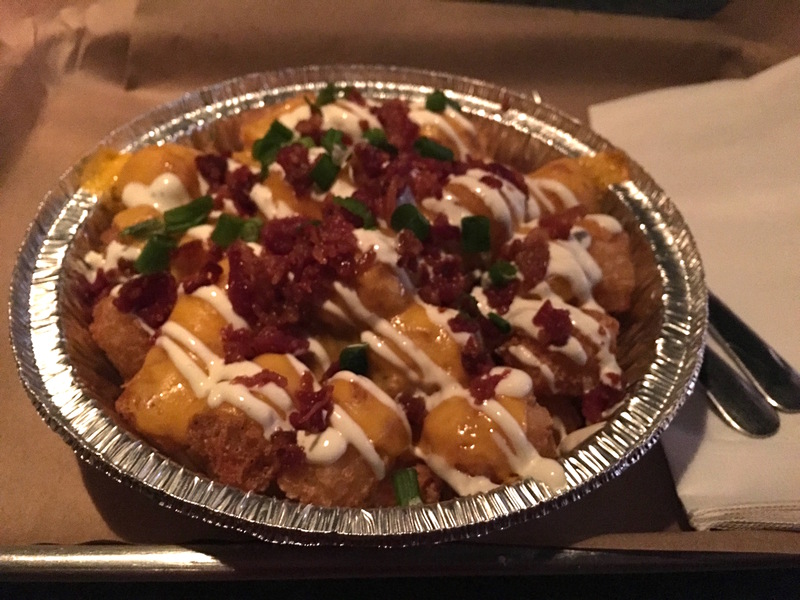 My fave hands down: the loaded tator tots. Get a table size ($8.00). Share them. Love them. Devour them. Or, try a few different sidecar combos ($4.00 each) and share. Poutine tator tots (single order). My friend Korie was a huge fan of these! Holy smokes these loaded tator tots are SO good! We ordered a large to share; however, my friend Mackenzie fought me for the last few bites! Note: these are ordered separately and not part of the sandwich price. Now, I grew up on fried bologna sandwiches. Still love them. I was really excited to find this on the menu. It was good; the bologna was my favorite part, as it should be. However, I’m used to bologna with yellow mustard, onion, and pickle. Nation’s version has cheddar, onion straws, and dijonnaise. While I liked this sandwich, I would order it again and do it less fancy. 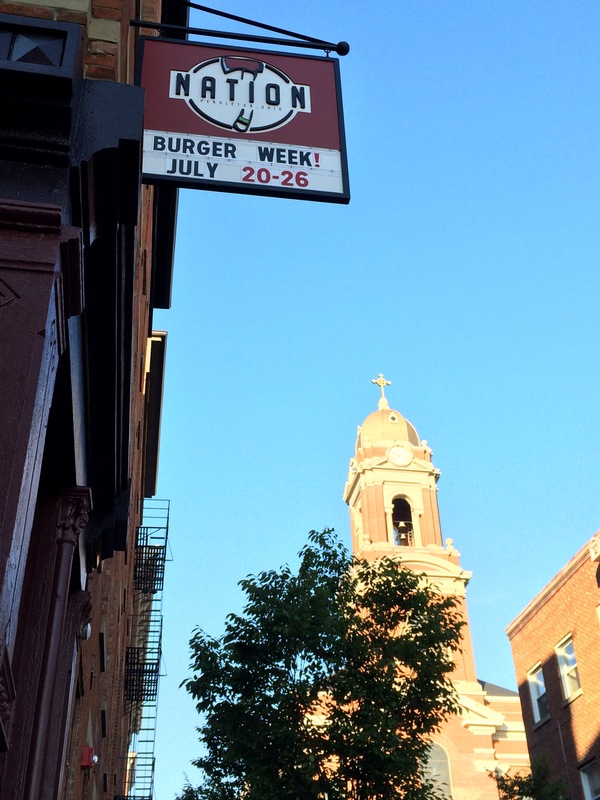 Both the whiskey burger and bologna were served on Challah buns from Sixteen Bricks bakery. So soft! 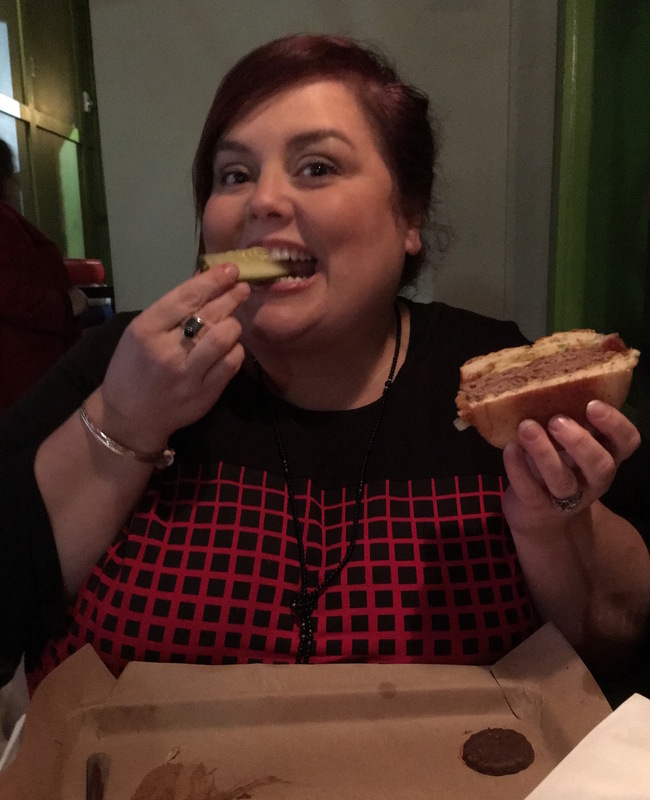 Me enjoying fried bologna and a dill pickle! Feels like home. 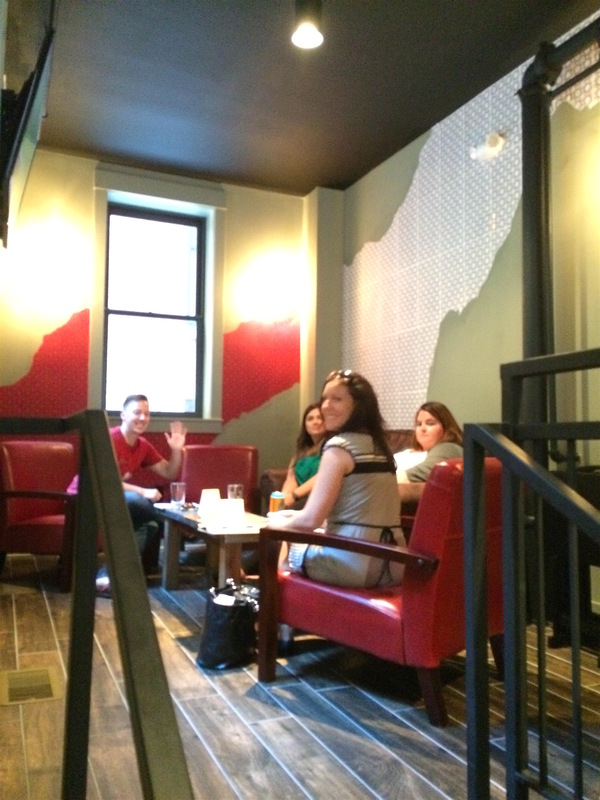 Nation Kitchen & Bar is a bit roomier than many of the restaurants in the OTR area. This makes me happy. No matter how good the food is at a restaurant, I’m not a fan of feeling clausterphobic while I eat. 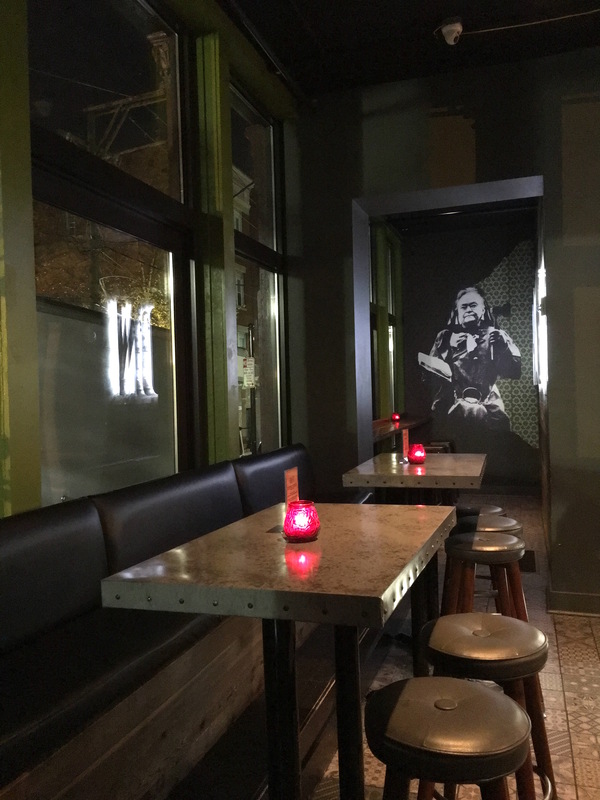 I appreciate the wrap around bar so-to-speak, the two “upstairs” rooms- one with comfy chairs, and the number of tables by windows. 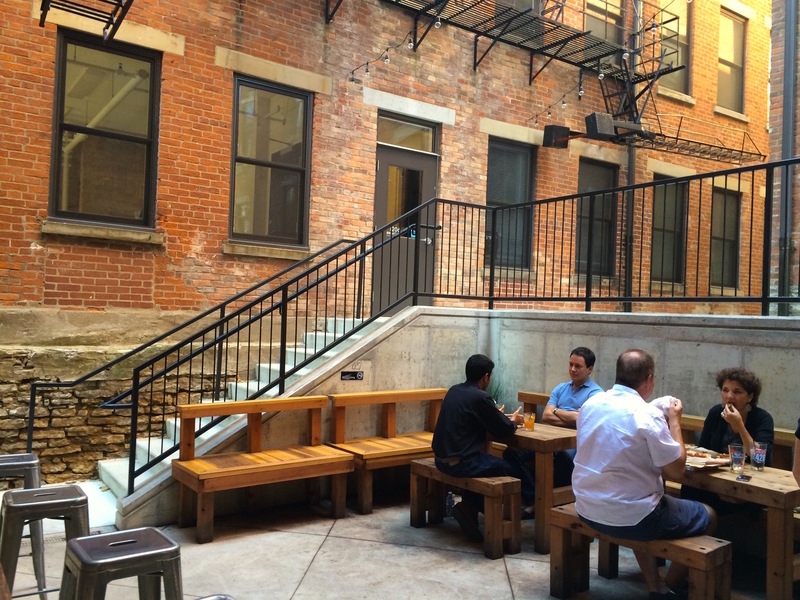 And that back patio!? Just love it. They have heaters out there too if you want to watch a game or grab a bite outside during the colder seasons. The bar area when first entering. Bar wraps around to the other room. Nice touch. Plenty of tables by windows! On this night, we were there late so most people were seated closer to the bar. 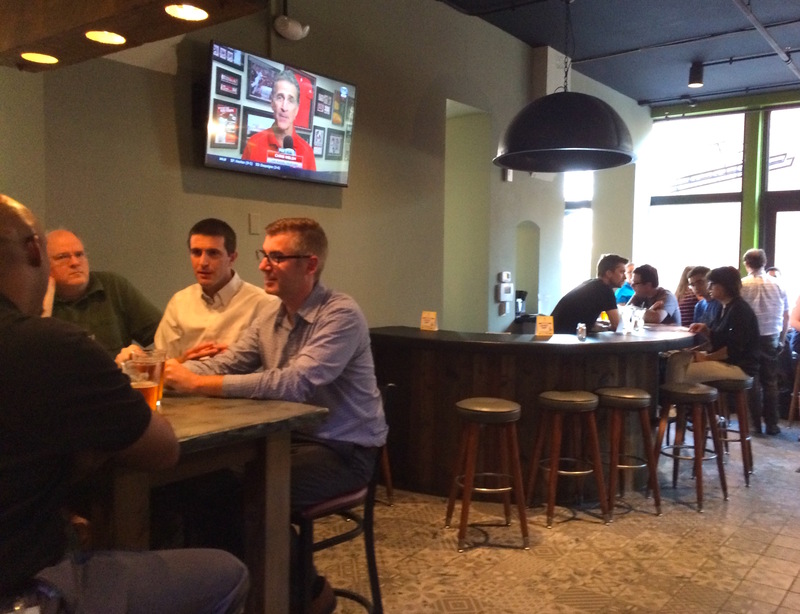 If you’re into beer, they have everything from non-craft beers such as Budweiser and Little Kings to very local craft beers such as Rhinegeist and Mad Tree. It’s a solid selection so there’s something for everyone. 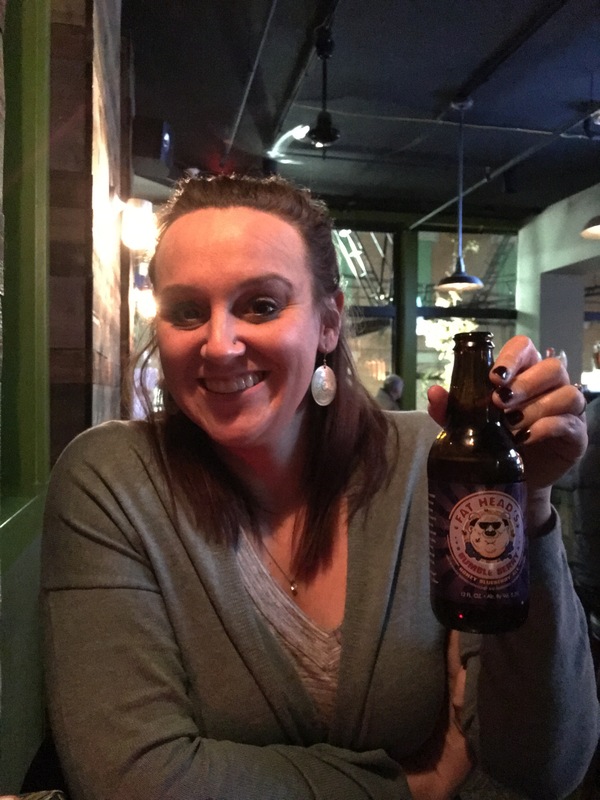 This girl likes her berry beers! Best of all, there’s a story behind Nation (I love a story) and it’s all about community building! Check it out on the website. Nation also serves a burger of the month and $1.00 of the proceeds from each burger ordered goes to charity. Pretty cool. And last, but certainly not least, burgers come with a dill pickle spear AND a thin mint cookie!! What!? I’m sold! If I were fairy godmother of restaurant land, I would wave my magic wand and all sandwiches in restaurant land would come with dill pickle spears and thin mint cookies! P.S.- If you’ve never explored a Final Friday in the Pendleton Art Center, check that out while you’re in the area! GO THERE (Nation Kitchen & Bar)! 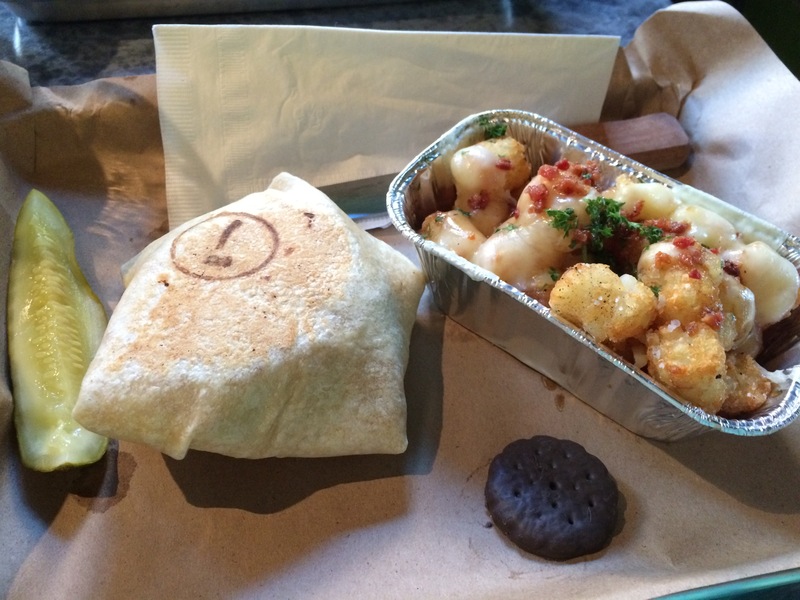 TRY THAT (quesadilla burger, whiskey bacon burger, loaded tator tots)! GO THERE! TRY THAT! is a Cincinnati based blog about getting out there and being open to new places and new experiences. Only then can we say, "Been there. Done that!" This blog supports making memories, being present, celebrating friendships, and seeking out that which is local. GO out. TRY something. Have fun! Always know when I post!